The mineral rich basalt loams, permeable clays and underlying limestones at Crawford River are a rare confluence of terroirs which yield an amazing quality of Riesling. 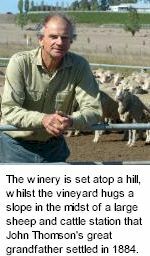 The Thomson family had been intimately familiar with the property for a century, eventually turning parts of their grazing enterprise over to viticulture after neighbour Karl Seppelt established one of Victoria's most felicitous new vineyards in the 1960s. Henty offers the exquisite regal charm of the world's great Riesling appellations, the richness of Riquewihr, elegance of Eden and comfort of Clare. Bright pale hues. Fresh nose of white florals and lime, hints of pear and creamy macadamia nut overtones. The soft, intense palate is layered with fleshy white stone fruit, supported by a line of gently poised acidity from start to finish. Well rounded with a creamy honeysuckle mid palate and stoney mineral quality which adds complexity and textural crispness. Wonderfully long, exciting finish.